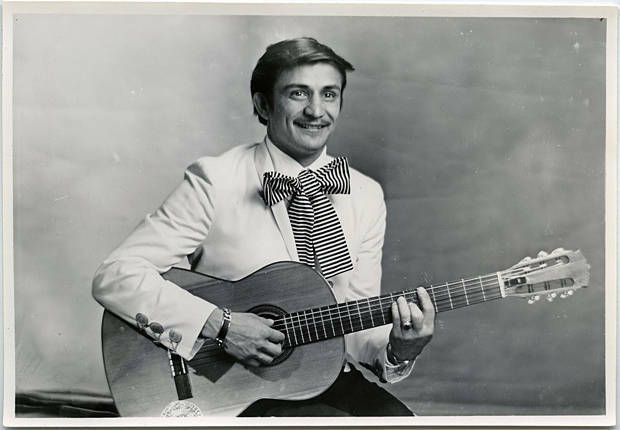 Black and white portrait of a man holding a classical guitar. The man wears wear the more modern traditional 'traje de charro' costume of the mariachi musician: fitted pants with elaborate decoration, especially along the side seam, and short, fitted jackets decorated with elaborate silver buttons. White shirts and large, striped bow ties complete his costume. He also wears an I. D. bracelet, a popular fashion accoutrement in the 1950 and 1960s. See also WCMpic_014505.